A little bit more from a past guest, Michiel Klonhammer from LearningStone about how the world of work is changing. Lisette appeared on Entrepreneur on Fire! 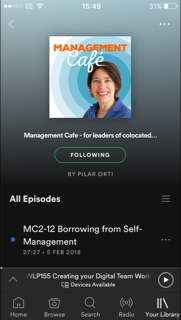 Remember to also listen to the Management Café podcast. 06:50mins Updates. Lisette's trip to the US and the live Happy Melly event. Pilar's thoughts on the experiment 'Flipping the Online Classroom' and our unidirectional relationship with the screen. On the other hand, creating a podcast like Management Café which is all about delivery of information is a struggle. We recorded the day after the US Elections, so yes, we talk about that (briefly). We talk about this episode of The Future of Work https://thefutureorganization.com/diversity-inclusiveness-important-today-tomorrow/ noticing that EY is extending flexible work to the whole of their workforce. Why Lisette and Pilar would make terrible digital nomads. Being on the go vs being in your home office / designated workspace. Understanding what you need to do your best work, especially if you or your team are about to make the transition to working away from the office. What context suits you best? What do YOU need, logistically, to do your work? Questions to ask if you want to work remotely at your company. What kind of expectations do people have when they start working as a virtual team? When you make the transition, you get to have all the conversations in your team about how you work together that need to be had in any case! The spectrum of remote work: working from home right to traveling the world.